STARKVILLE, Miss. 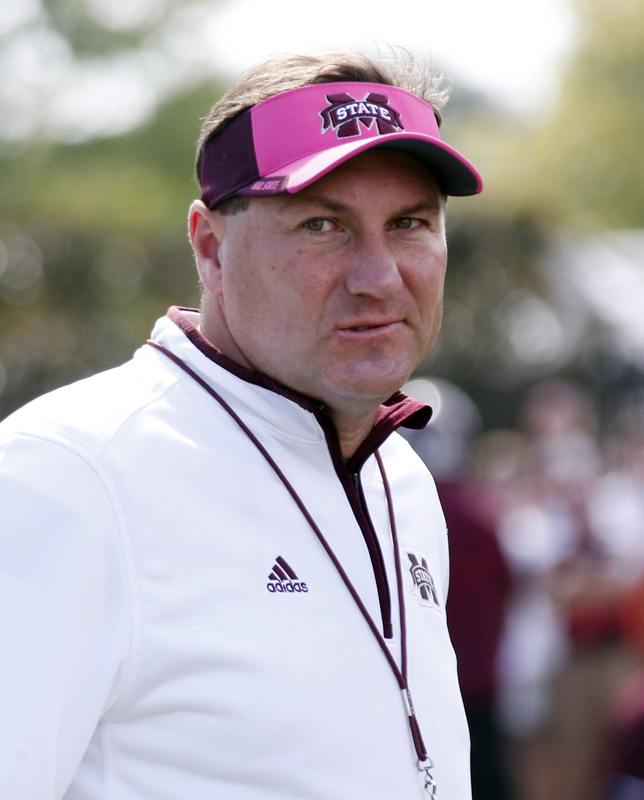 – Mississippi State coach Dan Mullen grinned broadly as he walked off the field, pumping his fist with one arm while holding his daughter Breelyn in the other. The deafening roar of the crowd’s trademark cowbells showered the field and the players danced around in celebration. The biggest home game in Mississippi State history had just turned into its biggest victory. Dak Prescott ran for two touchdowns and threw for another to lead No. 3 Mississippi State over No. 2 Auburn 38-23 on Saturday night at Davis Wade Stadium. Prescott, who jumped into the Heisman Trophy conversation last weekend with a breakout game against Texas A&M, turned in another solid performance. He completed 18 of 34 passes for 246 yards while running for 121 yards. He also had lots of help. Josh Robinson ran for 97 yards and two touchdowns, De’Runnya Wilson caught four passes for 72 yards, including a 34-yard touchdown catch, and the Bulldogs defense bailed out the offense with red zone stops following turnovers. The Bulldogs jumped out to a stunning 21-0 lead in the first nine minutes – helped by two Auburn turnovers on its first two offensive plays – but the Tigers pulled within 28-20 in the third quarter. They couldn’t complete the comeback, though, undone by Ricardo Louis’ fumble in the fourth quarter, untimely penalties and an inconsistent offense. Auburn’s Nick Marshall threw for 209 yards, two touchdowns and two interceptions while also running for 100 yards. Mississippi State won despite committing four turnovers. Auburn also had four turnovers. The Bulldogs will find out today if the victory was enough to jump Florida State and earn the first No. 1 national ranking in school history. Florida State defeated Syracuse 38-20 on Saturday.